The study, which tracked the wages, mortality and incarceration rates of 200,000 14 to 26 year olds who applied or participated in New York's youth employment programs, found that participants who held steady summer jobs were not only less likely to end up in prison, they were also more likely to stay alive. "We were particularly surprised about the mortality results: In essence, the program saved about 20 lives per year over the four years that we studied," wrote the researchers, who were from the Wharton School of Business, the University of California at Berkeley and U.S. Treasury Department. "Those of us who have been in this field for many years have always known intuitively that the program, while only a six-week program, kept people engaged and out of trouble," said Bill Chong, New York City's Commissioner of Youth and Community Development, which oversees the programs the researchers studied. "What I think surprised us from the study was the long-term impact." However, working during the summer did little to boost the participant's future earnings potential or the likelihood that they would go on to enroll in college, the researchers found. The problem: access to quality, higher-paying jobs. "What matters is what job they get placed in for the summer of the program, because that job tends to be 'sticky,'" researchers said. "The youths who end up being camp counselors or working in daycare centers, they tend to gravitate towards those kinds of jobs in the future, and those jobs on average earn a little bit less than other jobs." 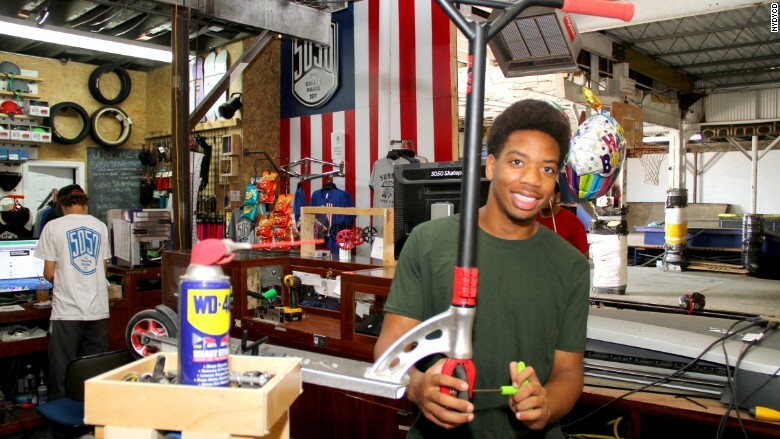 Tshawn Ross, 17, from Staten Island, NYC, working on a scooter last summer at United Activities Unlimited. This summer he's working at a day camp. Chong says he understands that what's good for a 14-year-old isn't the same as for a 20-year-old. "The typical summer job working at a non-profit is a great experience for a 14- or 15-year old," he said. "It's their first job, but as we begin to work with juniors and seniors in high school and those in college, we want to better align the job experience with their long-term goals." A former participant in the New York youth employment program himself, Chong is now leaning on other successful participants, such as "Shark Tank" star Daymond John, to help him to attract more employers. This year, Chong says his office has added almost 500 jobs from companies like AOL, Pandora, Verizon, Young & Rubicam, even the city's medical examiner's office. New York's summer youth employment programs placed about 53,000 eligible participants in minimum wage jobs and higher-paying internships this year. "Many of these companies have existing internship programs," he said. "But the young people they attract are already in the orbit of the companies. They may be relatives or friends of friends." Chong says he wants to open the door for talented young people from low-income communities who don't have the social networks and connections. "It's shown now through this study that this program has helped to save lives, but we want to launch careers and create opportunities that maybe haven't been there before," he said.